Essential Questions: How does art expand our thinking? use a variety of lines in a scratch art design. 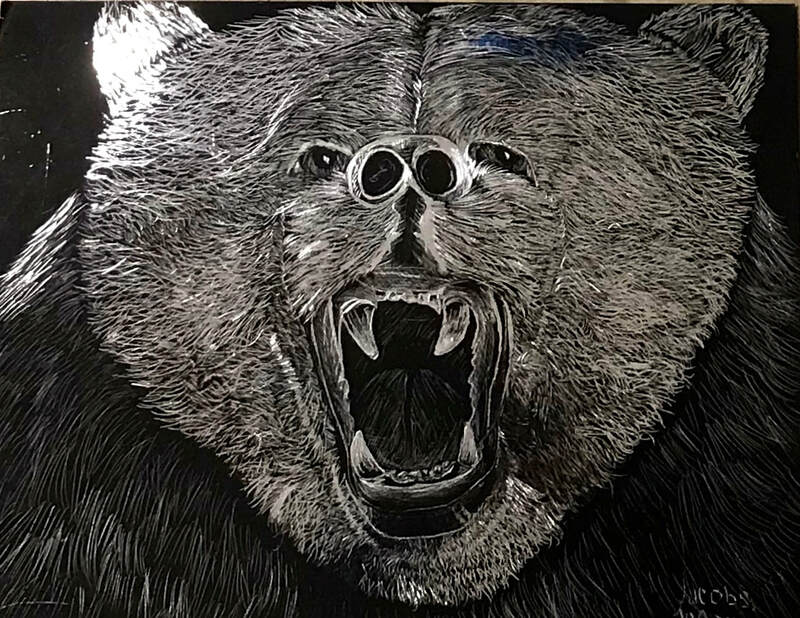 create a scratchboard artwork of an animal using the elements of line and value. Download the rubric by clicking on the button below. Annotate on the rubric, take a photo of your finished work, and turn both rubric and photo in to Schoology in the place provided. Scratchboard or scraperboard (as it is known as in Europe) is a direct form of engraving/etching which originated in the UK and Europe in the 19th century prior to the introduction of modern photographic techniques and was used as a less expensive alternative to other engraving/etching substrates such as metal - copper and steel plating; woodcuts, linocuts, etc; and could be photographically reproduced in smaller formats without losing too much detail. Scratchboard was used widely for scientific illustration ie: botanical, zoological, anatomical; in maps, and product advertising illustration in magazines, newspapers, and books . . . The very first scraperboards originally consisted of cardboard or other stiff paper coated with chalk or china clay. Scraperboards used during the 1930's were white with no ink coating. Write the following words and definitions in your sketchbook. Stipple - to paint, engrave, or draw by means of dots or small touches.(http://www.dictionary.com/browse/stipple?s=t). Values are created by placing dots closer together (dark values) or farther apart (light values). Please watch the 3 videos below before beginning your project. For this project you will create a scratch art piece of an animal. Your research will consist of two parts. First, you will be looking at scratchboard art/artist, and then you will select an animal for your final piece. Keep in mind the following things when you research your animal. Choose an animal that is suitable for the scratchboard technique. Texture is an important part of scratchboard so choose an animal with fur/feathers or one that has some type of pattern. This is better than choosing an animal with smooth skin. Look for a closeup of the face, an unusual angle, and a good composition. You may choose to crop the photo to get a better composition for your final piece. Work from both a color photo for details and a black and white photo to help you see the values. Color photos can be made into black & white in iPhoto. Draw your animal on newsprint paper to work out all of your details. Fill at least two-thirds of your surface with your animal. Empty areas help balance the drawing, but should be a minimum of the scratchboard surface. Use a scratch knife, Xacto knife, and/or a thumbtack to make marks. Use sandpaper to sharpen dull tools. Follow the direction of the fur/feathers. Notice how the texture is layered and pay attention to directional changes as it moves over the face. Work carefully and conservatively. Once you remove the black surface it is gone. It is better to not remove all the you need and go back later to fix it. Pressing too hard on the tool will rip the paper. ​Begin by choosing your animal. We will focus mainly on the face so you don't need to do the entire body, although you may choose to do so. Try to find a photo that shows the character of the animal or is unique in some way. A good example of this is the lion artwork at the top of this page. Rather than drawing the lion without any expression, the artist chose to draw a lion as it yawned. Once you have chosen what animal you would like to draw, find 3 different poses or images of that type of animal. Discuss which pose will be best with 2 people at your table. Once you have chosen your image, save it to use later. Each student will be provided a 2"x2" piece of scratchboard to try scratching. Use different tools like a thumb tack, X-acto knife, and the scratch tool. Also try hatching, cross hatching, dashes and dots. Create a small value scale using a texture that gets darker and darker. Have an are that is totally scratched out. See the example to the left that shows what your piece practice piece may look like. It does not need to look exactly the same or need to be labeled. Technique: I use a crosshatching pattern to create eyes. I find that this creates the smoothest gradients. By using this type of stroke I am also setting my eyes apart from all the other textures in the piece as this area is the only place where cross-hatching is present, besides noses. This helps them to read as 'different' when set against fur. It is common to render the eyes as a series of strokes that radiate out from the pupil like a starburst. People tend to make these strokes vary in weight to give the eye those natural variations. Upon inspecting eyes, however, you will notice that the transitions are much more subtle and tend to not be straight lines. Imperfections: Eyes can present several imperfections. The most notable are spots and natural variations in the pigmentation of the iris. The second is the discharge that forms in the tear ducts. In "Cautious Observation" (detail, right side) you can see that I have added these 'eye boogers' rather than leaving them out. Technique: Noses are rendered with a mixture of cross hatching, similar to eyes, and stippling. Again, using these strokes helps to create a texture that is drastically different than fur and will allow these parts to stand out. Noses of canines are often moist and can have strong, bright highlights under the right lighting conditions. If you observe the texture of the canine nose up close you will find that it is actually made up of little 'cell' shaped formations. When rendering your subject up close, or at a large scale, make sure to include these. Feline subjects have a more subtle nose texture, but it is still present. For subjects at a distance this texture is usually omitted. Also note the texture where the muzzle fur meets the nose and the skin can be seen through the sparse hairs. Imperfections: Noses can come with a variety of imperfections. These include scars, scuffs, and various debris that stick to them. Things such as loose hairs, dirt, tiny bits of grass, etc can sometimes be found clinging to a wet nose. Those who have outdoor dogs are familiar with this. Techniques: Fur comes in variety of lengths and textures. Pay attention to the direction and texture of the fur you are rendering. Often, people render fur as long or short lines following the growth pattern. If you look at a real animal's coat however you will find that hairs tend to have natural variation and are often not 'neat' at all. I use small groupings of several scratches together to create the texture for short fur, such as that found around the eyes and on the muzzle. For longer hair I will use slightly 'wiggly' strokes to simulate the 'scraggly' look. Imperfections: The most common imperfections found in fur are scars, bent/loose hairs that are still clinging to the coat and debris from the environment. Grass, small leaves, burrs, etc will often find their way into an animal's coat, especially along the legs, belly, and chest. If the animal lays with it's head on the floor, it's not uncommon to find these in the cheek fur too! Scars usually are present on the face, although they can be found on the legs too. They are most noticeable in short fur and will be present as dark areas without fur. Because the scar is an indentation, pay special attention to the highlights and shadows on either side of the scar. The scar is essentially 'embossed' into the fur. These highlights and shadows are very important and will give your scar depth and make it believable. Pits and areas where the fur is clumped together are also prevalent. Watch for these! Fur is seldom 'perfect'. These pits are most common on the foreheads of canines, but also occur in the long neck fur of canines and felines alike. A note on imperfections: A lot of people tend to overlook these, possibly because they want to portray the animal in a 'perfect' light or maybe because they just don't notice them! These little details add life to your subject. Animals in the wild are, for lack of a better word, dirty. They are not bathed and groomed on a consistent basis like our beloved pets. No one is there to pull the burrs from their coat or dust them off. Sure, they lick themselves clean from time to time, but they won't stop and do this every time they get up, so chances are they may walk around with stuff hanging off of them and not care/notice. In the wild they will have scars, mats in their fur, loose hairs/shedded 'clumps' hanging off of them, and various environmental debris tangled into their hair. These are normal and are a part of nature, so why not add them? That said, if they are not present in your ref and you choose to add them, remember that 'less is more'. Unless your animal just finished rolling all over the floor, he or she will not be completely coated in debris. Likewise, unless your animal is old and has gotten into a lot of fights, their face will not be riddled with scars. As with all things, it is important not to over do it.